Well, if you're not sick of it by now, the infamous Nordstrom Anniversary Sale is officially upon us and is open to the public in a few hours! 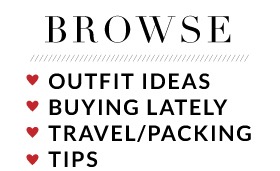 I've been wearing all my new stuff throughout the week because 1) I love it all and 2) naturally I would love to help you make your shopping list. 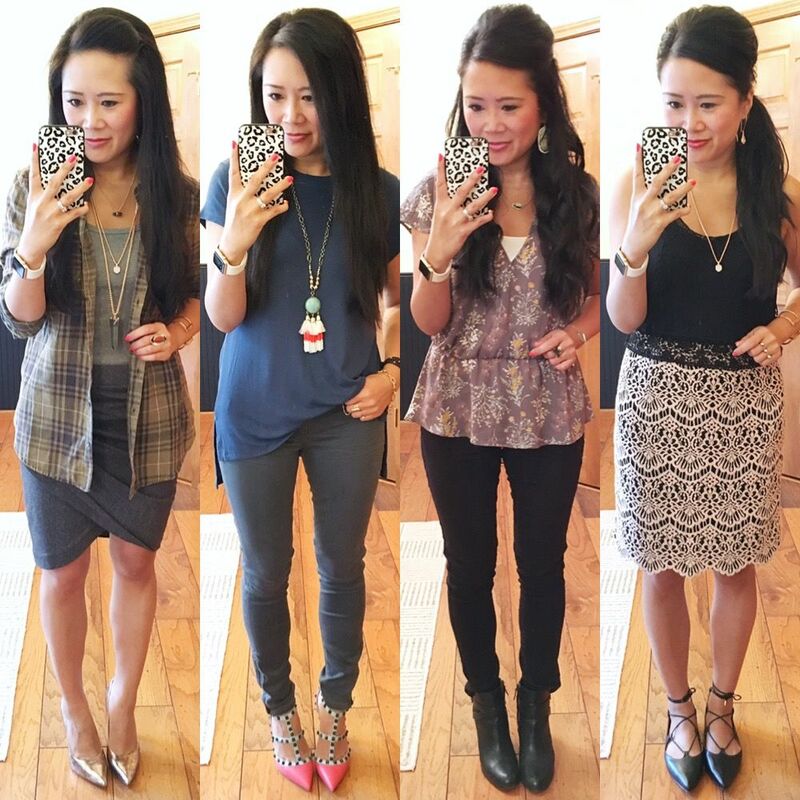 I've put together a not-so-random roundup of this week's outfits in honor of the big sale. 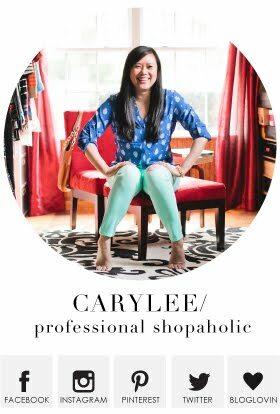 At the end of the post, I'm sharing the online purchases I've made since my in-store shopping trip so you can see those, too! I love love love how this outfit turned out. 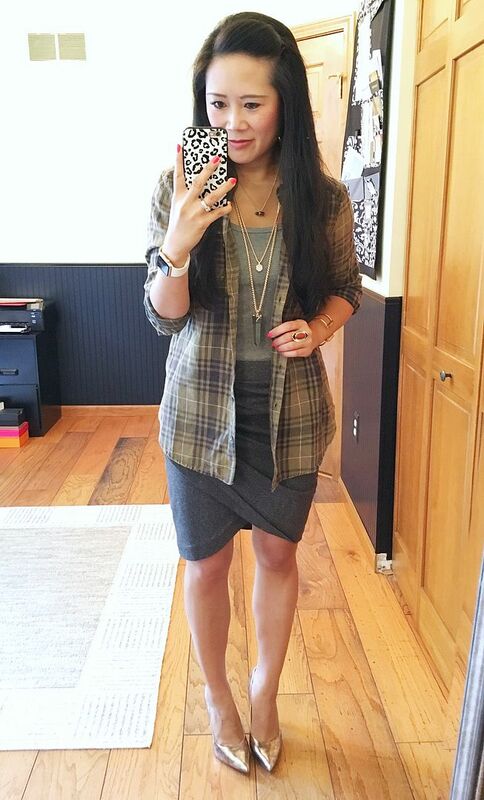 The tank and skirt were a bit too bare for the frigid office, but the plaid shirt was the perfect outfit topper! And the olive color is exactly what I've been wanting! The necklaces and metallic heels make me happy with this. Sometimes I have no idea what accessories I want to wear and then I smile in the mirror when it all comes together. I'm wearing an XS in this plaid top. I put together this outfit based on the simple formula of jeans and a tee shirt. It doesn't get much easier than that. The necklace is not an anniversary sale item, but it's still worth mentioning as it's SO much fun. I loved playing up the colors of the necklace by wearing my colorblock heels to finish off the look. 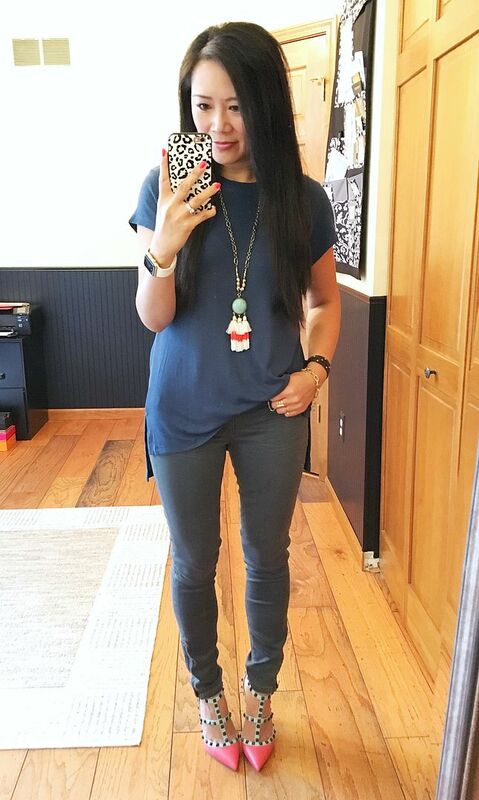 The tee is super soft and the longer hem in the back makes it perfect with leggings, too. I'm actually wearing it with leggings as I type this! The size small fits great! I wore this outfit on the longest travel day of my life! Ok, so maybe that is an exaggeration! The top worked great though. I picked it for my trip because I knew it was easy, comfortable, and would not wrinkle despite how long the work day ended up being. I decided to wear a bralette under it for modesty, though when I wore it last weekend, I didn't bother with that step. I am wearing a small. 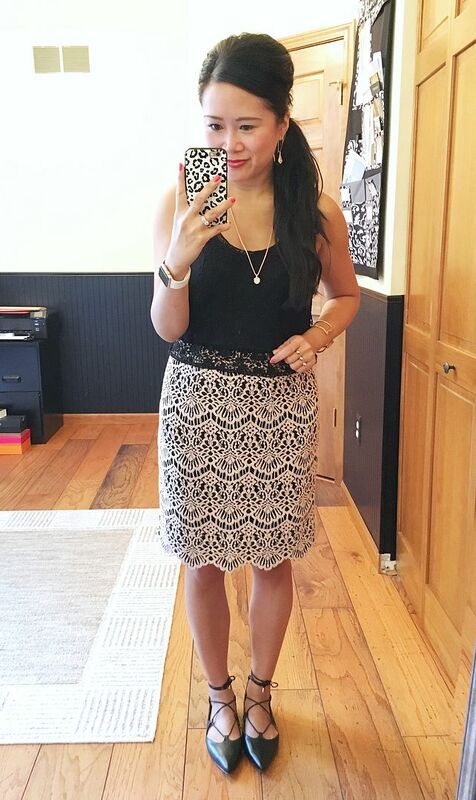 I love when new pieces like this skirt pair well with old favorites like this lace tank and lace-up flats. Since the day before turned into a long and late work day, I really had no strength to put forth any kind of effort into an outfit. This was so easy to throw together, but the lace really does make it special. The scallop edge adds one more detail to gush over, but my most favorite thing about this skirt is that is is not constricting at all. It's really comfy! I am wearing a size 4. 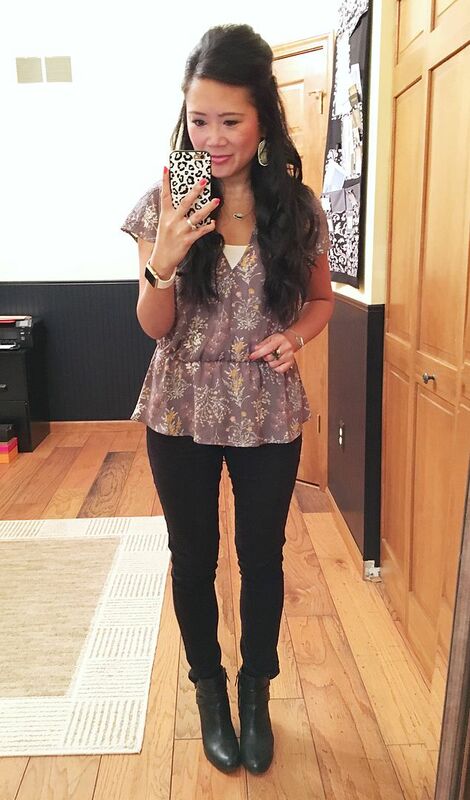 And if you're asking yourself what the heck to wear to shop the sale, this is what I wore and why! 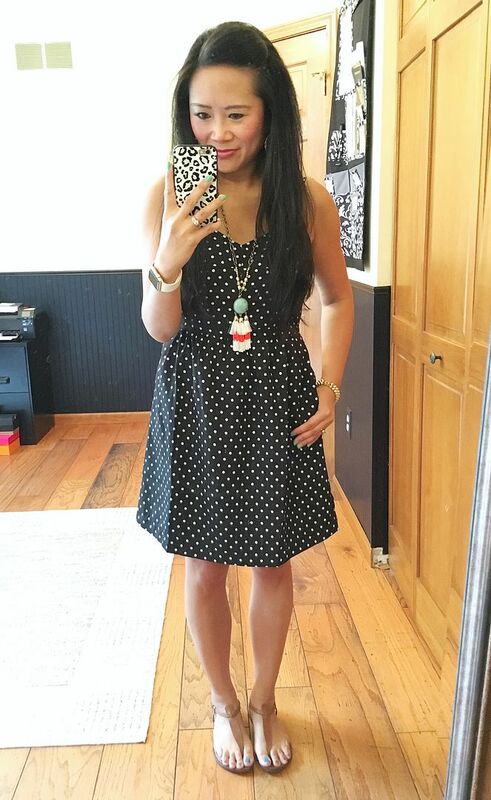 The dress is super easy to zip on and off, which makes changing in the dressing room super fast and less daunting. The flat sandals mean that I don't have to worry about my feet hurting, and again, they're easy to slip on and off when trying other shoes and clothes on! I pinned my hair back because ain't nobody got time to worry about hair falling in their face when they're marathon shopping! I've also been sharing Anniversary Sale purchases on the blog throughout the week. In case you missed them, I wanted to pull in a couple of great detail photos to entice you also! How gorgeous are these booties? The side view is the best view. I just love the cut out detail. And I wore them all day for errands and they were perfectly comfy! Here's a better look at the top I wore for my travel day. I wanted to show you what it looks like without the bralette underneath. I tried on this top when I was in-store, but needed a smaller size. The regular XS was ginormous! I ordered a petite extra small and it fits so much better! Just for good measure, I have a petite XXS on its way to me so I can compare the fit. This was the one thing in store that I was most bummed they didn't have in my size. I'm tempted to try other colors because it's just such a fun and easy top! And this is everything else that's on their way to me as we speak! The Kendra Scott earrings had me craving the coordinating bracelet. And, I always get a pair of Zella leggings every anniversary sale, so I couldn't NOT get some this time! The tank was really pretty - super simple but I love the color so much, it was worth the try. The Gigis are not part of the sale, but I've been wanting a pink or a red pair, and I loved that these were suede! OK, that's officially all I can tell you about the sale. Between this post and last week's post, you officially have my perspective of stalk-worthy items! Now fly away, butterfly, and buy everything that makes your heart happy!!! Good luck! Please report back! Love your picks! I just got my stuff in the mail today! I cannot wait for fall!